Thanks very much indeed to Channel 13 News who reassured me that the roof of the Gold Coast car park would actually be a great place to watch the Strip fireworks. They got it wrong. I already knew that the view of most of the landmark hotels from there is obstructed by either the Rio or some construction project, but there is a great view of Luxor and Mandalay Bay. - "I’m here at Mandalay Bay with lots of drunk people. Hey look, here’s a middle-aged couple who scored tickets to get into the Foundation Room tonight, they dance like your dad, how cool is that?". - "Yeah! Happy new year! Woo! Vegas baby!". 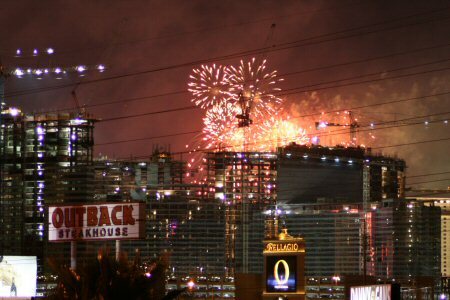 - "Fireworks are going to be set off from the roofs of seven hotels along the Strip at midnight and this is one of them. Now, back to someone else who is somewhere else in Vegas with more drunk people". 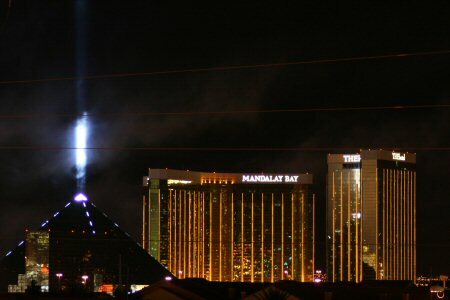 Right there in the Luxor’s tractor beam you can see smoke drifting across from the fireworks – as they shot up from the roof… of the MGM Grand. Mandalay Bay was never supposed to be one of the seven. They were: MGM Grand, Planet Hollywood, Flamingo, Venetian, Treasure Island, Circus Circus and Stratosphere. That’s the CityCenter construction, illumated by some badly obstructed fireworks. MGM is behind there somewhere, but you just can’t see any of its green glow. This really doesn’t look like Vegas at all, if it wasn’t for the Bellagio sign in the foreground it really could be anywhere!